The success of a customer experience improvement program often boils down to how well the company is able to empower employees across the organization. 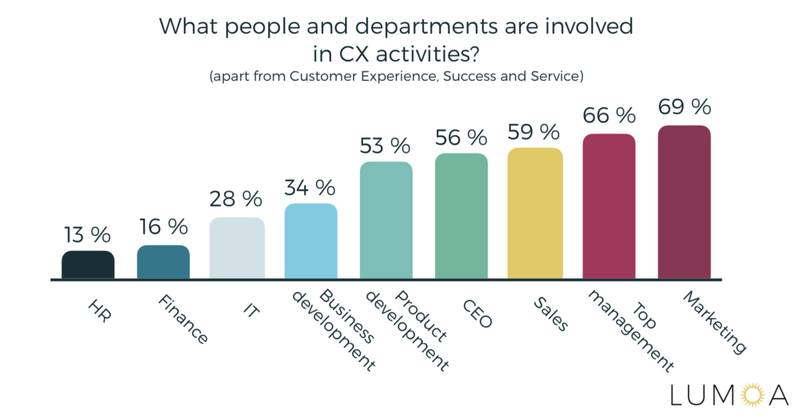 According to the customer experience statistics, 79% of employees in CX-leading companies are engaged, compared with only 49% in the companies with CX below average. At the same time, empowerment requires access to data, motivation, tools, and authority to fix things. How to build a customer-centric culture? Let’s start one step at a time. As the most obvious starting point, you need to be able to hear the voice of your customers. Surprisingly, according to 2016 Forrester research, 39% of companies don’t regularly ask customers for feedback about their interactions — the most basic form of CX measurement. Start building a systematic approach to handling customer feedback from A to Z: from collecting and analyzing data, to delighting individuals and making changes in the long-term. “Most companies aim to grow with some financial metrics. The philosophy, that we developed over the years, is that revenue and growth is a function of happy customers. It’s not about selling or upselling but delivering exceptional value.” - shared Michael Redbord, General Manager, at Hubspot Service Hub in one of our interviews. 72% of companies don’t review customer experience metrics or share them with all employees regularly according to the statistics. This obviously makes getting buy-in from the executive team, knowing about available resources, and justifying the need for those resources very difficult – in fact they are among the main challenges for the customer operations teams. Share data and results of the Customer Experience analytics in an easy-to-use tool. This ensures that there is a shared understanding of what matters. When the results of the analytics provide a common understanding of what is important for the organization (e.g. in terms of issues to fix), employees can start to have a fact-based discussion. Before the shared understanding exists, people often go back insisting the organization should focus on their favorite topic because “even my 12-year-old daughter says she doesn’t like it”. The organization needs to ensure that they can get beyond the anecdotal evidence in the discussions about customer experience. That is the only way the focus of the discussion shifts from arguing the facts towards agreeing on improvement needs and actions. According to the Lumoa research, 55% of companies suffer from organizational silos, incl. slow internal processes and unwillingness to change. “Making customer experience relevant to the individual employee is such a critical aspect of change management. The objective of our CX program is as follows – for each employee to understand the customer journey and their role in making a positive impact on that journey. We’ve had to deviate from the standard corporate communications to achieve this objective, favoring instead interactive dialogs in small groups. We get people talking about customer experience on a personal level and involved in consistently improving by focusing on both Voice of the Customer and Voice of the Employee programs.” - adds Nate Brown, Director of Customer Experience at UL EHSS. Shared understanding is important, but, ensure that people can access not only the analytics results but also the actual customer feedback – hearing the customers’ voice and reading the real comments with all their emotions can be a strong tool to motivate people to act on the feedback. Knowing that the top level also reads customer comments helps in the customer-centric cultural transformation as well. However, keep in mind that if the original comments are the only thing people see, they easily get stuck to the anecdotal evidence backing their own prejudices. If the access to customer feedback is always complemented with a shared understanding of what really drives customer satisfaction, people can finally focus on making improvements. Find or create one communications channel that your whole team uses, and all employees can see. For instance, if you use Slack messaging, you can create one channel for all customer feedback. One of the easiest ways to leverage the role of customer feedback in a company is to bring feedback from online into the physical space of your office. ”Getting everyone closer to customer feedback should be a priority for every business. Sharing customer feedback improves empathy for customers and motivates our team. It reignites their belief in the mission and refreshes their understanding of how well the company is doing in the eyes of the customer. It's pretty simple: happier people do better work. We share positive customer feedback on a “customer love” wall near our breakout areas -- every day there's a new card that people see and talk about over lunch,” shares James Doman-Pipe, Global Marketing Manager at Kayako. There’s an established practice to review the performance of customer support agents by the number of tickets closed. What will be the unconscious (or even conscious) choice of the agent? Right. To close as many tickets as possible, no matter how. Now, think of it differently. What if the agent’s performance is assessed based on Net Promoter Score (NPS) or Customer Satisfaction (CSAT)? Now the focus is completely opposite - to make customers happy. This also includes the top management because its support is vitally important for any customer experience improvement activity to succeed. Another important group are the product owners and product managers. Their focus on great customer experience (or lack of it) manifests itself every day through the product related decisions they make. Quite a few companies have introduced a single customer experience KPI, such as NPS, across the whole company as a key target. When everyone’s incentives are partially tied to it, it is easier to get the personnel to become more customer oriented. However, the difficulty often arises, when the people further from customer interface don’t feel empowered to influence the metric. Therefore, they get frustrated and this certainly doesn’t improve their motivation. The key is to do this only together with the approach we described as step two above: help everyone to understand their role in influencing the customer experience. Building the infrastructure to measure true customer success metrics, and incentivizing your team around those numbers, is the best way to ensure your company thinks about the customer first in every decision you make. More than often, employees working in non-customer facing roles, either in the management or in the back-office functions underestimate their influence on customer experience. For example, how could an HR manager possibly influence the customer experience? Easily. HR’s role is to hire the right customer-facing professionals and help to shape the company culture. People managers play a key role in finding new ways to make the employees of the company happier. Yet, as we have recently discovered, their impact is ignored in up to 90% of companies. It's very interesting that in most companies the marketing takes care of the customer experience as a whole. The top management and the CEO now understand more and more often that the customer experience is rather a necessity than a cost. However, the back-office functions, like HR or Finance, are very seldom involved in the CX. Find out about how each department can impact customer experience in this ultimate guide "Customer Experience, Whose Business Is It?" Indeed, as a leader of your company, it’s extremely important to understand the impact of the back-office functions yourself. At the same time, keep in mind that you also need to explain, cherish and encourage the employees to understand their role as well: very often they don’t realize that their work has a significant influence on the customers. Another interesting and novel practice that could help you to bring the employees closer to the customers is to have “customer service” days. That is when the top management or any non-customer facing team sits down at the customer service department and talks to the real customers of the company. Always keep in mind that if you want your employees to take personal accountability for customer success, they should see the management doing it first. "There is no shortcut to creating an organization capable of delivering a positive human to human interaction across every touch point. It can only be done when all employees are part of a purpose-driven culture, hence mirroring their experience to the customer, - shared Nate Brown - You want to improve CX? Make the investment to improve your employee experience.” Indeed, companies that lead in customer experience have 60% more engaged employees, and study after study has shown that investing in employee experience impacts the customer experience and can generate a high ROI for the company. A lesson discovered by a company with a mission to be the "Earth's Most Customer-Centric Company” is simple: create new value for your customers without being asked. "You need to listen to customers, they won't tell you everything. You need to invent on their behalf. Kindle, EC2 would not have been developed if we did not have an inventive culture.” - elaborated Amazon’s Jeff Bezos in one of his interviews. Discover the Bezos strategy for customer centricity from the video below. Don’t mind the low quality of the picture, listen to what he has to say (it’s mind-blowing)! It’s easy to blame one customer service rep for a negative customer outcome - but don’t do that. Instead, find out what went wrong and how you can fix the problem -- because if one person is making a mistake, it’s possible that other employees are, too. Talk to low-performing employees and high-performing employees and connect them to learn best practices and pitfalls from one another. An open discussion will encourage new ideas by inviting high-performing employees to share their strategies with the whole company. Etsy has built a workplace without a fear of punishment or retribution during project or campaign post-mortems by working hard to understand how an accident happened in order to better prevent it happening in the future. Looking towards solutions and learning from past mistakes ensures elevated team morale, transparency and an eagerness to collaborate and develop together. Don’t forget to celebrate -- because often a small acknowledgment can boost your team morale and satisfaction. Sharing employee wins and praise from customers will help you set the tone for the rest of the team, so employees can understand which direction you’re going and what kind of goals they should follow. Customer-centricity can’t be achieved overnight - it’s a long project that requires dedicated commitment from everyone, especially the top management of the company. Celebrate all of your team’s wins to remind them how important customers and their voices are and lead your company towards customer-centric transformation.